File photo of a megaload parked along Idaho’s Highway 12. A federal judge blocked the route to further megaload traffic until the Forest Service reviews the impact to a wild and scenic corridor. The first of three hulking pieces of oil equipment, known as “megaloads,” is expected to start its slow, winding journey through eastern Oregon Monday. It's taking a circuitous detour to avoid an Idaho route that ended in a court injunction. But opponents hope to keep controversy hot on the tail of the Oregon shipments. 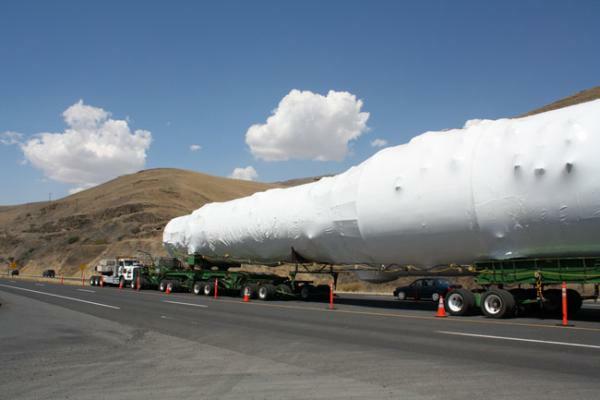 The massive truck is going from the Port of Umatilla to the border town of Homedale, Idaho. In all, it’s two lanes wide and 380 feet long, so the load has to travel by night and pull over every five to seven miles to let cars go by. Ultimately, it's headed to the oil sands of Alberta, Canada. Some of the same groups that have criticized trains transporting oil and coal through the Northwest are now organizing against the megaloads in Oregon. It’s not just about this specific route, says Kayla Godowa-Tufti, an activist and member of the Confederated Tribes of the Warm Springs. Godowa-Tufti says the load also passes by sensitive salmon restoration areas near Prairie City, Oregon. A spokeswoman for the Hillsboro-based shipper Omega Morgan says no vegetation is being altered along the route and the company is working closely with local officials to ensure a smooth trip. The so-called “megaload” won’t travel over the Thanksgiving holiday weekend. A company hired by a subsidiary of General Electric to ship massive oil refinery equipment to the tar sands project in Canada is now seeking to haul the oversized loads across eastern Oregon and southern Idaho. The first of three megaloads could begin making its way through Oregon this weekend before crossing into Idaho's southwestern corner next week. The Oregon Department of Transportation has already issued permits for the first shipment, while Idaho highway officials are still studying the travel plan submitted by shipper Omega Morgan. A subsidiary of General Electric says it’s looking for alternative options for moving huge water purification equipment from the Northwest to Alberta, Canada. A route through the middle of Idaho turned into a legal battle with the Nez Perce Tribe, but the alternatives are limited. Resources Conservation Company International, the GE subsidiary, decided to withdraw a federal appeal that sought to re-open Idaho's Highway 12 to so-called “megaloads.” A judge had ordered the Forest Service to close the wild and scenic corridor to the shipments. A General Electric Co. subsidiary has given up its legal fight to haul the second of two huge loads of water purification equipment through the Nez Perce-Clearwater National Forest and will find another way to get the equipment to the Canadian oil fields. The Lewiston Tribune reports Resources Conservation Company International filed documents Thursday saying it was dropping its emergency motion to stay an injunction that prevented it from using the U.S. Highway 12 route. A federal judge has rejected a bid to reopen a scenic, two-lane highway in northern Idaho so a General Electric Co. subsidiary can resume shipments of massive oil-field equipment. U.S. District Judge B. Lynn Winmill issued the decision Thursday in the latest battle over the use of U.S. Highway 12 as a shipping route for the wide, long and heavy loads.